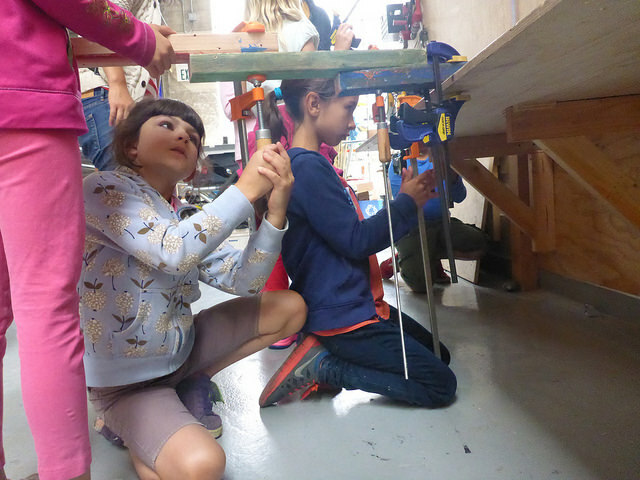 In this series, we offer step-by-step breakdowns of how Tinkering School helps kids use tools safely and efficiently. Feel free to use, share, comment and re-mix! Clamps are great--they hold stuff together. 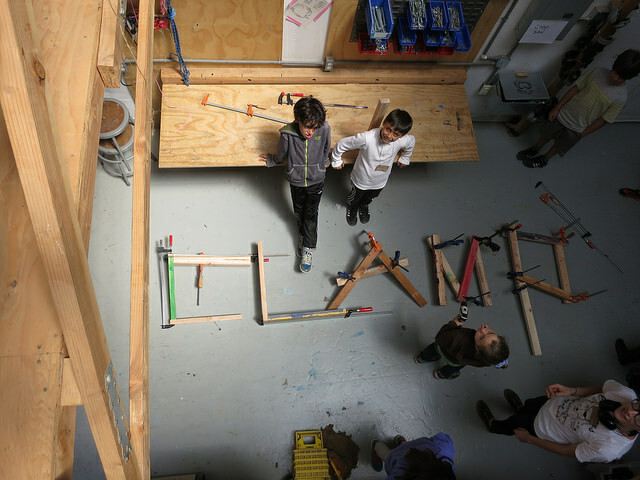 For young builders, clamps are even more than a way to keep work from moving--they're a path to self-sufficiency and a step away from dependence on adults. 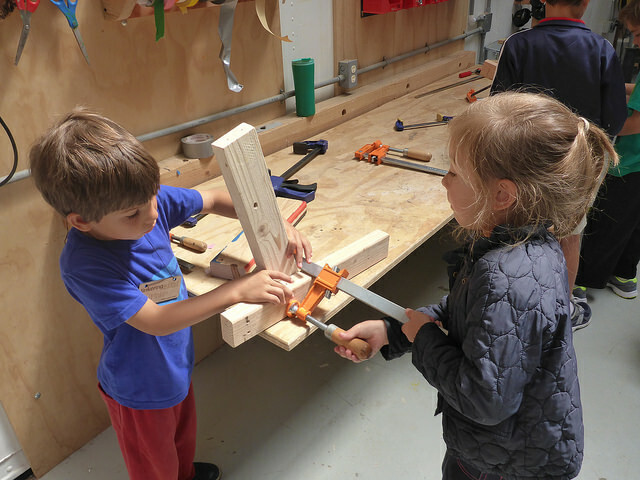 Here's our approach to training young builders on clamps. 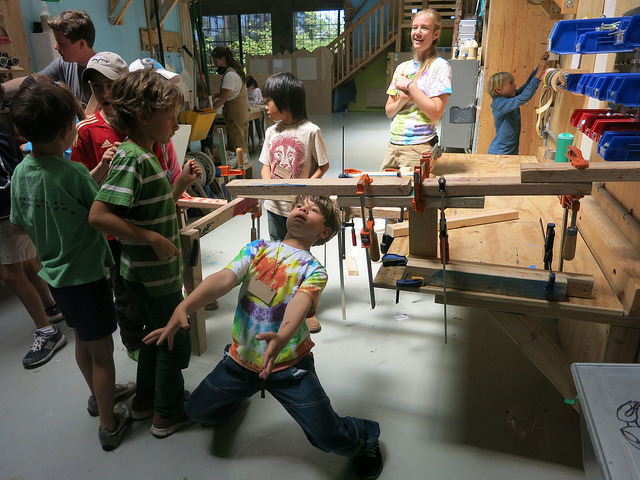 At the beginning of clamp training, reiterate that all power tools the campers will be using are two-handed tools. Since both hands will be operating the tool, campers will need a way to hold their work in place, and (bonus!) maybe even hold tiny work to a larger, more stable object. In our shop we have two basic kinds of clamps: squeezy and twisty. Give a quick demo of the two types of clamps--with emphasis on the superior of the twisty variety. (The operation of Squeezy clamps is more easily-guessable, so these are often the first choice of campers. However, the extra 30 seconds involved in learning the operation of the Twisty is justified by their superior holding ability). 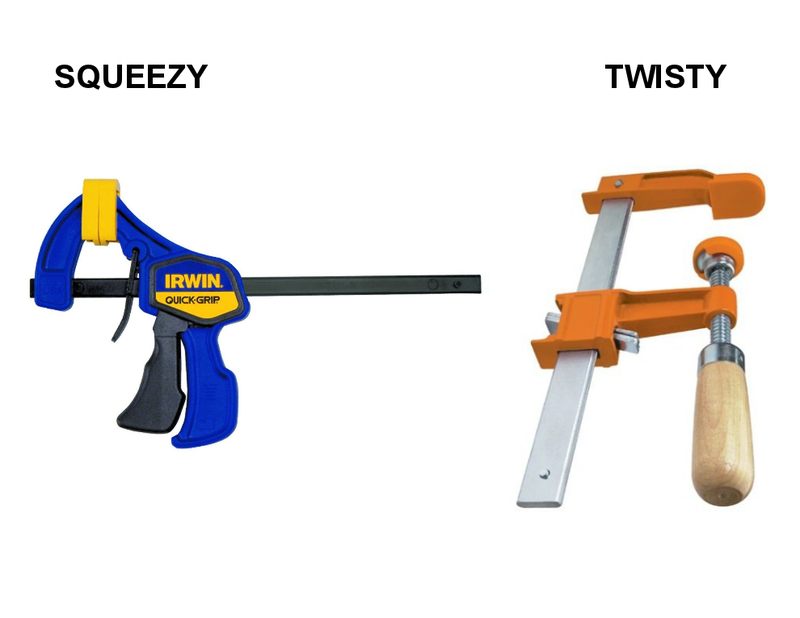 Squeezy: Show and tell how the clamp has two triggers, one smaller and one larger. Show and tell how pressing and holding the smaller trigger allows the jaw to slide backwards and forwards, making the opening larger or smaller. Show and tell how repeatedly, firmly squeezing the larger trigger slides the jaw forwards, making the opening smaller, to grip work. 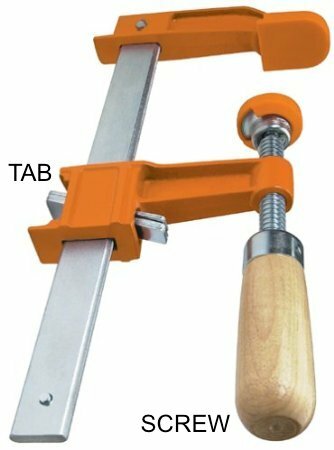 Twisty: Show and tell how there are two ways of interacting with the clamp--squeezing the tab to slide the lower jaw; and tightening the screw. Show and tell how squeezing the tab allows the lower jaw to slide backwards and forwards, making the opening larger or smaller. Show and tell how turning the screw makes the opening smaller, to grip work. 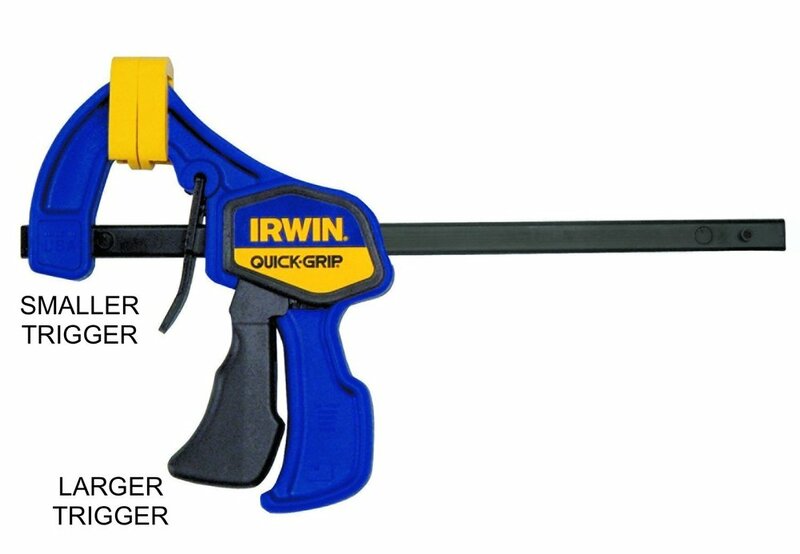 Be sure to show how either clamp can hold together two pieces of wood to be joined with screws, allowing the builder to use both hands in drilling. Also show how to clamp work to a workbench for greater stability. Actually screwing two clamped pieces together will add more context for the group. Let's face it--clamps lack the charisma and romance of the drills or chopsaw. After many years of trying to make clamp practice fun and exciting, we stumbled upon the Clamp-a-Ma-Jig! The challenge is to build the largest structure possible out of scraps of wood--held together only by clamps. And, now for the real fun of clamp training: the clamp-a-ma-jig! Build up, build out and hold a whole lot of 2x3s together with clamps. Build something taller than yourself, taller than the collaborator you’re working with, build a limbo, spell your name, you get the idea. Remember: clamps are heavy and pokey; when you un-clamp two pieces of wood, they are no longer clamped together! Think Before Clamping: Encourage kids to ask themselves: which two pieces am I trying to hold together? Are the pieces massive enough that they won't move after they're clamped, or should I clamp them to a large object for stability? Use hand to model how the clamp will hold the two pieces together. This is a great strategy because it replicates the actual shape of the mouth of the clamp and can help keep clampers from clamping to nothing. The long, unused tail of the clamp can get in the way of work, or even give an unpleasant poke. When possible, make sure that clamp tails are facing away from people!